I love fish! There are so many people that tell me they love fish but that they’re scared to cook it or all they know how to do is fry it. Don’t get me wrong, I love fried fish, but there are so many healthier and just as delicious ways to enjoy our friends from the salty sea. 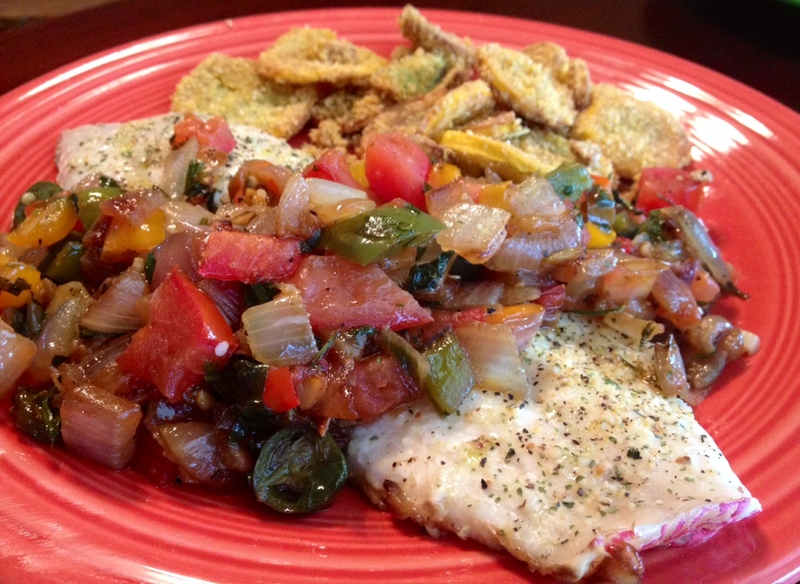 This red snapper is a very mild white fish, and if you can’t find snapper where you are, a similar tasting fish would be grouper, flounder, or another mild white flaky fish. 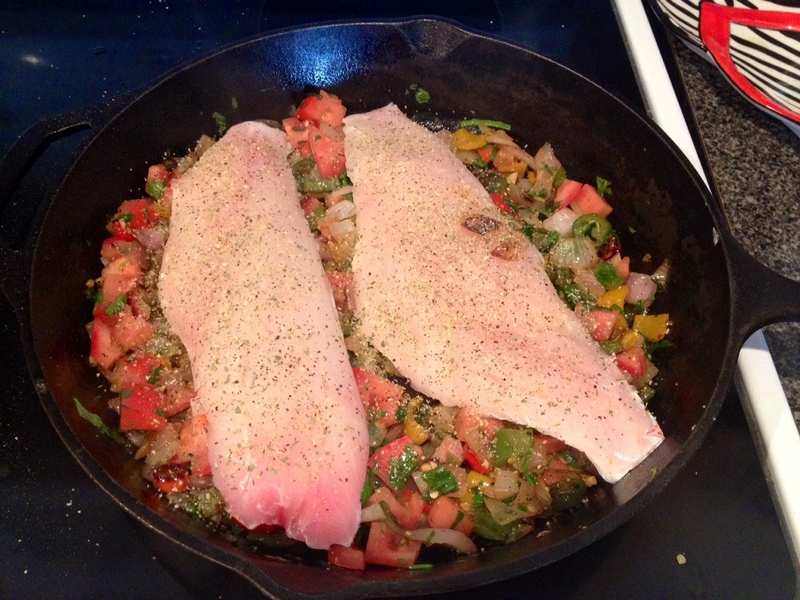 Halibut is delicious too, but it’s usually an arm and a leg, and I like to stick with the affordable stuff! 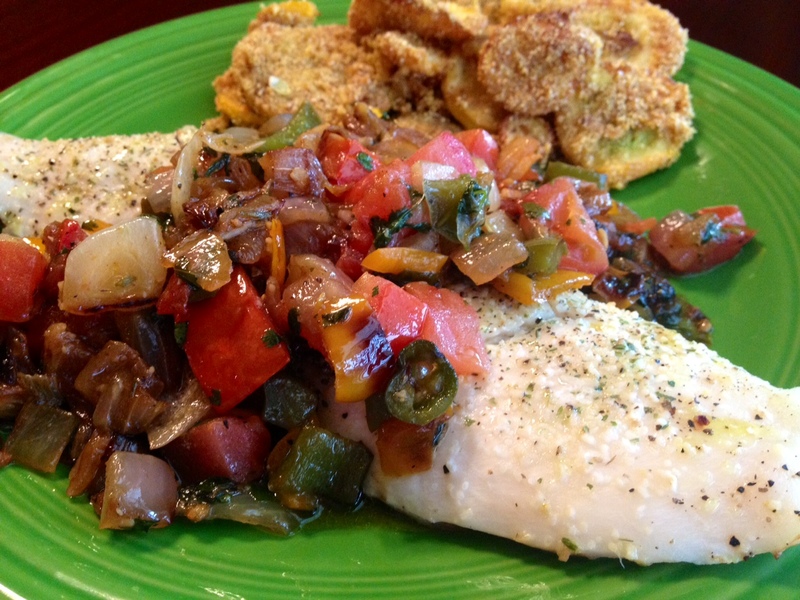 Normally I do sort of a cooked pico de gallo recipe with this fish, but I had some bell peppers in my garden that were ready to pick, so those got incorporated into this dish and I was so happy I put them in there! 1. Using an oven safe skillet (hello cast iron! 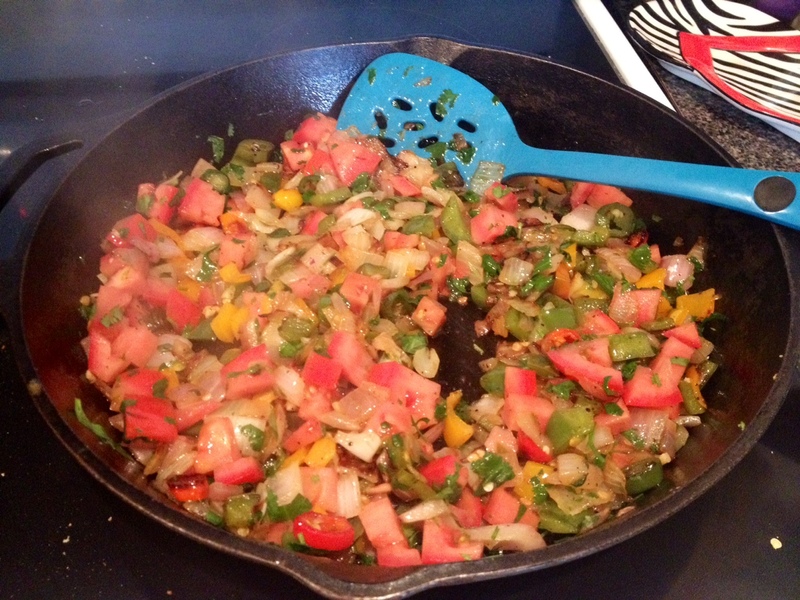 ), saute with about 3 T of butter and a drizzle of oil your onions and peppers and season with salt and pepper. This will take about 10 minutes or so on medium high heat. Then add your garlic and saute for a few more minutes. 2. Turn the heat off and add your chopped tomatoes and cilantro and add additional salt if needed. Stir that around until everything is incorporated. 3. 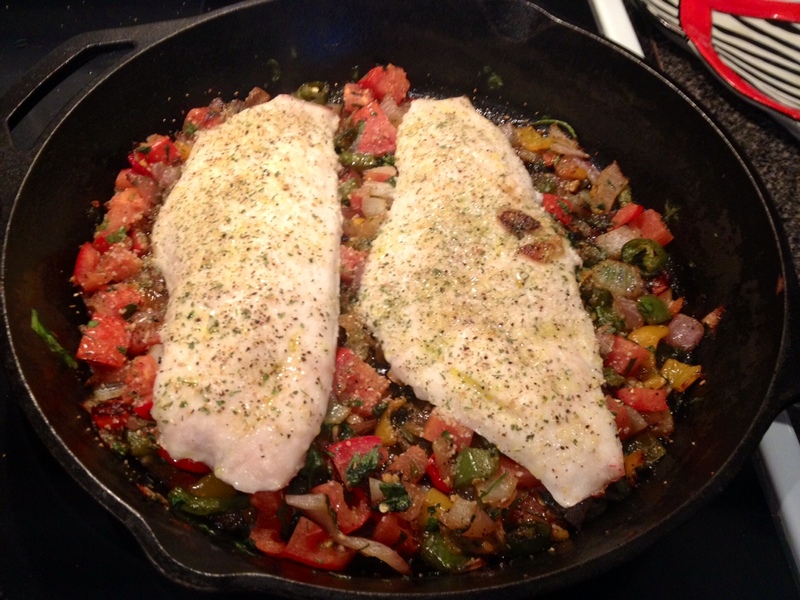 Place your seasoned fish filets on top of the veggies and place into a 425 degree oven for about 12 minutes. You’ll need to vary your time based on how many filets you have, the thickness, etc, but you get the idea that they’re going in and coming out pretty quickly. Also, I find it helps roast the fish and hold in the moisture if you drizzle the tops with a little olive oil as well as the seasoning you put on them. 4. I started checking my fish at 10 minutes and I could tell when it was done when the meat bounced back firmly and poked a fork in there and it was opaque. Remember, when you take it out it will continue to carry over cook, so there’s no need for you to cook the blazes out of it. 5. Plate that puppy up and serve with a twist of lime or a side of rice for a delicious and healthy meal! 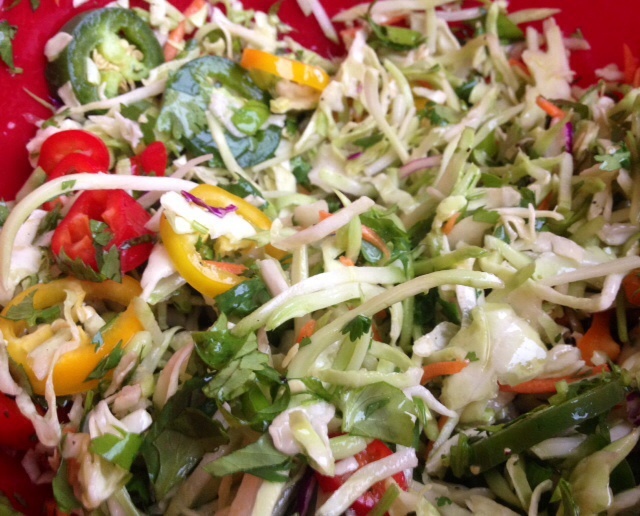 Y’all this coleslaw is so delicious and so good for you. Unlike creamy recipes, this one is vinegar based and has some heat. This is probably my most asked for recipe of anything I’ve ever made for a crowd. Here is the recipe for a single batch, but you can easily double or triple everything for large parties. 1. 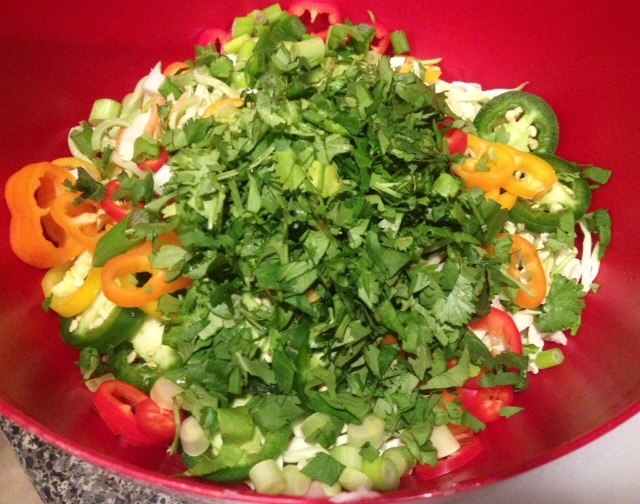 Combine mix and all chopped ingredients into a mixing bowl. 2. 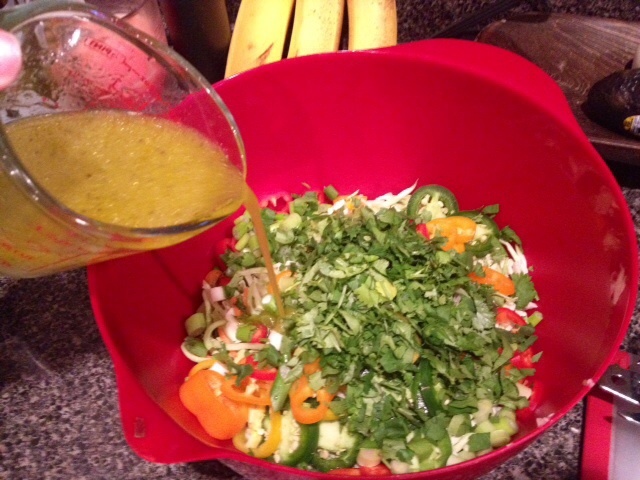 Whisk together white wine vinegar, oil, lime juice, seasonings, and sugar. Give it a taste and see if you like the sugar content in it. It should be sweet and tangy. Start off with 2 tsp and go from there. Once it’s whisked together, add to mixing bowl. 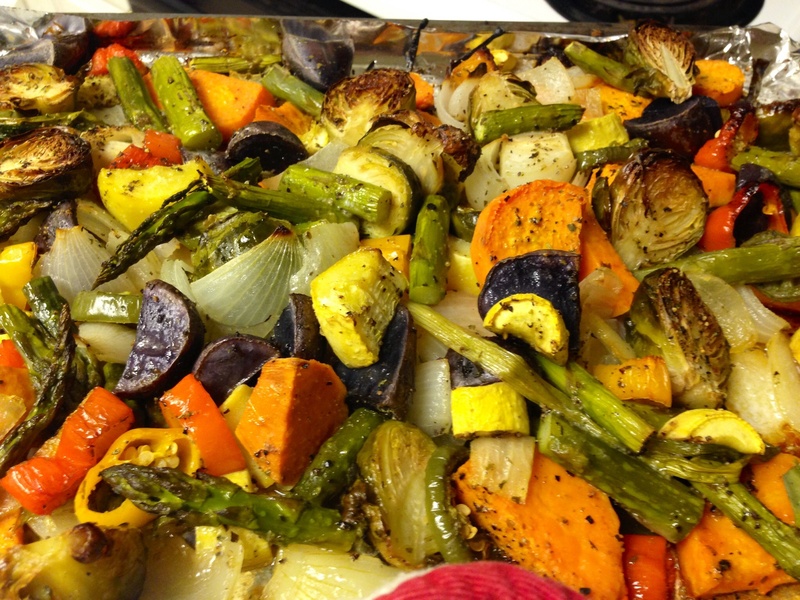 These roasted veggies are super delicious and very good for you. I’ve done virtually every veggie combo in this recipe, but these were what I had in my fridge: yellow squash, zucchini, asparagus, sweet potato, purple potato, sweet onion, Brussels Sprouts, jalapeño, sweet peppers, and green onion. Other veggies I love in here are cauliflower, broccolini, cherry tomatoes, carrots, whole garlic cloves, and bell peppers. The next day I love to chop any leftovers up and add to seasoned quinoa and add a can of drained black beans for dinner. 1. 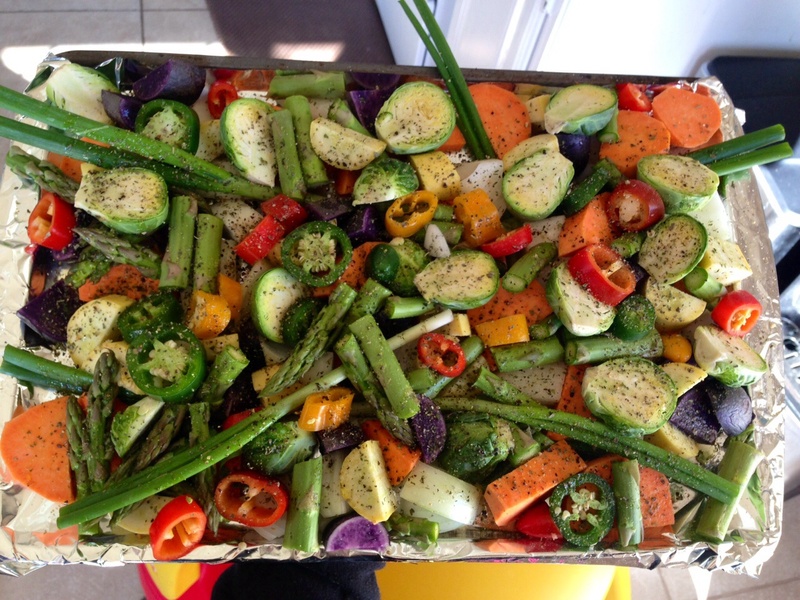 Cut up all your veggies and arrange on a sheet pan lined with foil (helps with cleanup later). 2. 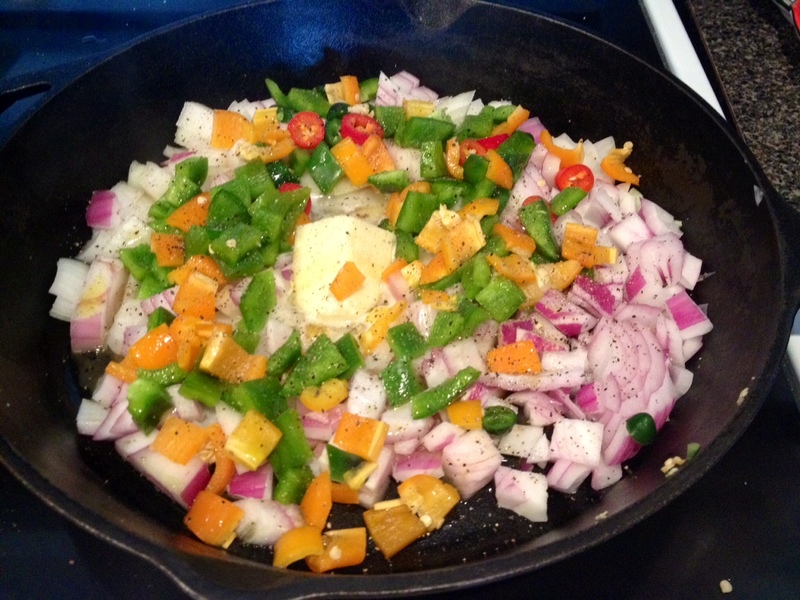 Drizzle olive oil all over veggies on the pan and add your little pats of butter if you’re using it. Then season liberally with salt and pepper. 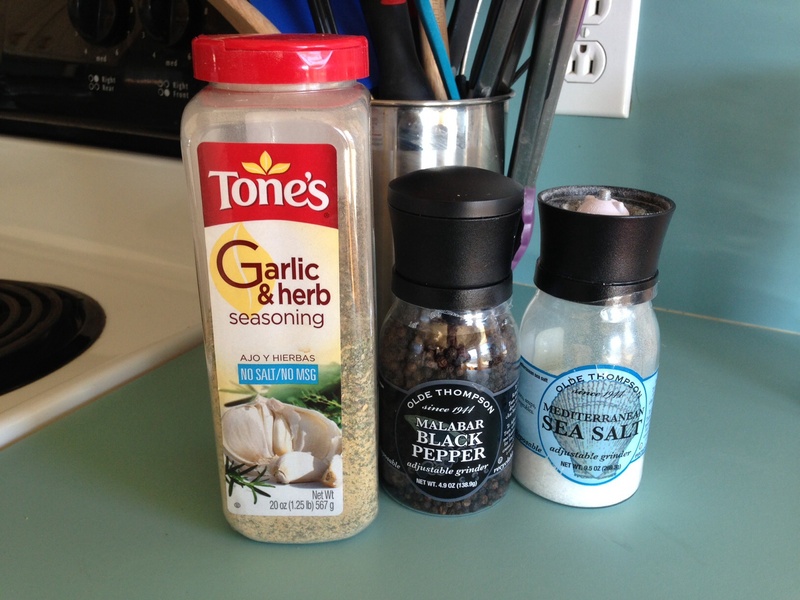 I also love to use Tone’s Garlic Herb (salt free) seasoning on my veggies, but you can use virtually any seasoning you like, just make sure there isn’t any salt in it, and if there is omit adding additional salt. 3. 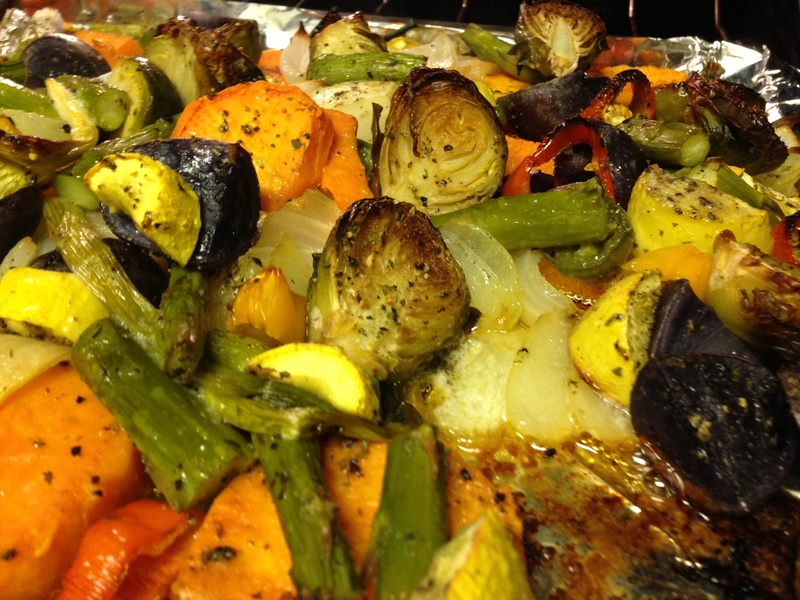 Place veggies in the oven at 425F for one hour. 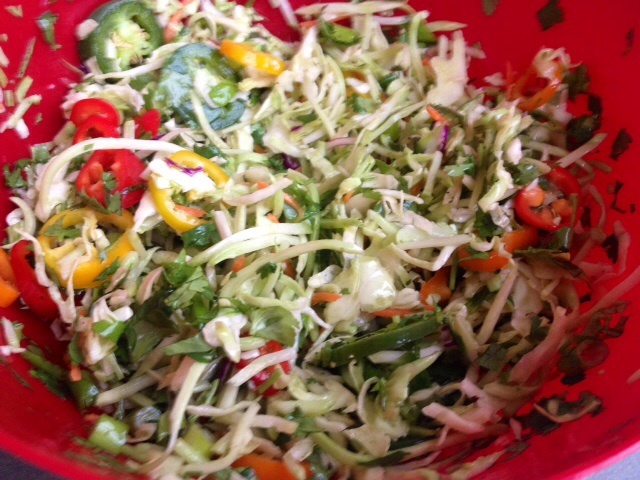 Be sure to stir veggies around about halfway through to ensure even cooking. 4. 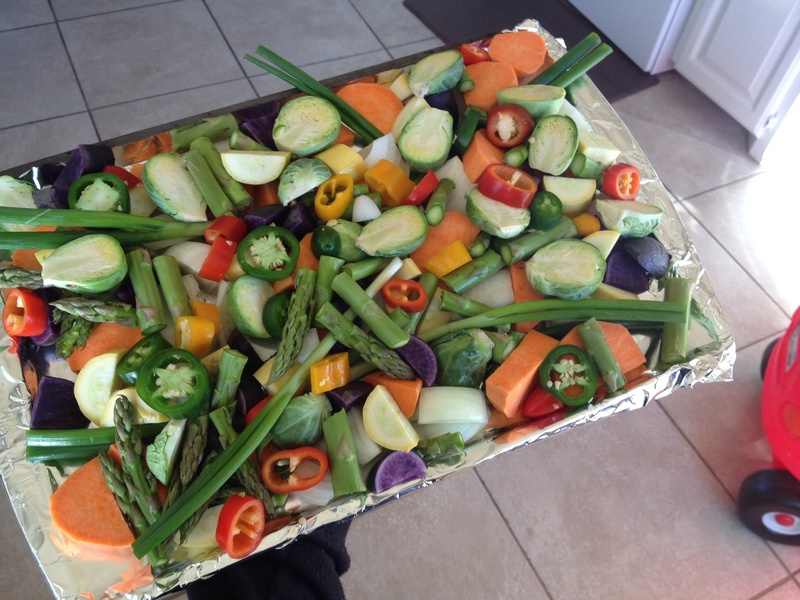 Veggies will be soft and roasted perfectly at an hour, but you can leave in a little longer if you like them browner.